Making money can be one of the most frustrating things in this game. Everything takes coin. When you hit the major cities, there are all sorts of enticements for you to buy. If you get into Transmog gear, or collecting pets and mounts, the costs can add up on top of the money necessary for you to not run everywhere or to fly fast enough to get to Galleon before he dies. It took me 4 months, but I managed to save enough to buy the Alliance chopper added in Warlords. Let me tell you how I did it. First, let's look at a brand new character. I have a brand new dwarf shaman here. 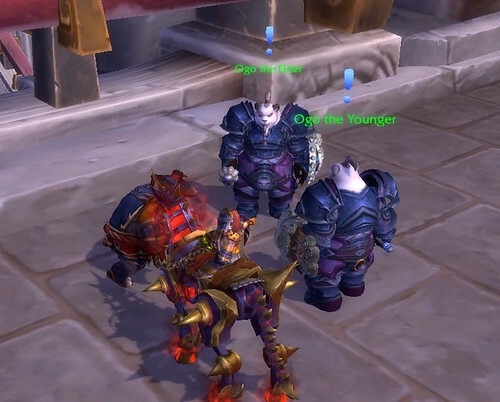 New toons start out with the clothes on their back, a backpack and a hearthstone. You have zero copper to your name. Start your drive to 1 or 100,000 gold by taking quests. Take every quest you can. If you are at some location where there are a number of quests, chances are very good they are all in the same place. If there is a quest that says, for instance, "Take this letter to Ironforge", it's going to take you away from completing the rest of those quests. Don't take that one. Finish all of these and then take the quest that tells you to go somewhere else. Sometimes, you'll be sent back, but not always. Then you have old quests in your log. Clear them out before moving on. Be sure you know what you're asked to do. 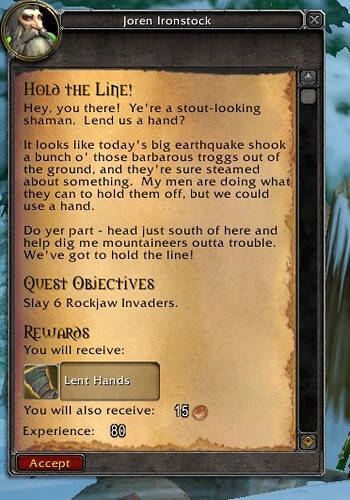 Yes, that does mean you'll have to read a bit of the quest text, but if you know you have this one, involving Rockjaw invaders and one to pick up archeology fragments and one to find beer and it's all in the same place, you will save time. Plus, you have an idea of what you're going to make. Turn everything in at once. Don't take any follow up quests until you've turned everything in. Then you can assess if you want to do the follow-up quests. I am a completionist so I'll generally do them, but if you have leveled by turning in quests, it might be to your benefit to go to the Hero Board in a capital city to see where it sends you. Higher level quests have bigger rewards. That's your call as to how much you want to do in any given location. Loot everything; every little thing. The Rockjaw Thumpers dropped only gold, but as you get higher level, you'll start getting all sorts of junk on the mobs. Loot it all. 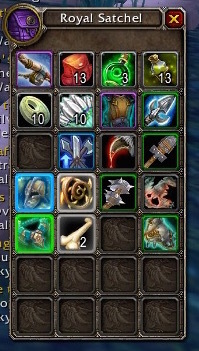 Stacks of the most ridiculous gray items can vendor for a surprising amount of gold. Here's one of Gimm's bags. I vendor every gray and white item I get. Green and blue gear is sent to a bank alt to be put in the Auction House. I put it up once and if it doesn't sell, it gets vendored. I don't need it disenchanted because my enchanter has a boatload of materials. The gold is more valuable to me. With Warlords, you can see, at a glance, what is considered vendor trash and what might be something you want to save. If you have outfitted your toon with heirloom gear, then selling any and all gear they get, unless you want it for Transmog, will net you a nice sum. It all adds up over time. One of the people in my guild with a large number of alts says that power leveling with heirlooms and without spending money other than for the basic mounts and mount speeds you need to get around, will net you 15,000 gold when you reach 100. I can't confirm this but it seems like it could be true. 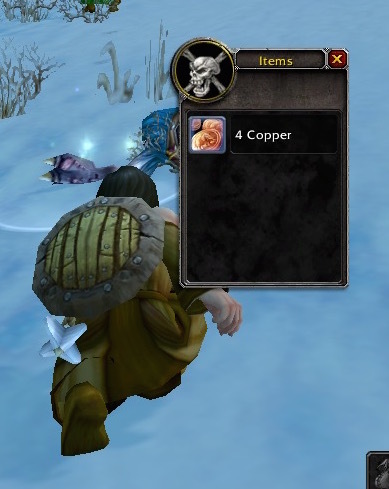 When I sold everything I felt I didn't need on this toon, I had 7.5 silver for 45 minutes work. That's not too shabby. She is not wearing heirlooms so the total could have been more if I'd sold the gear she got as drops and as quest rewards. Don't hesitate to use money as a guide to which piece of gear you should take from rewards. Mobs at low levels are pushovers and you can easily take on mobs 2-3 levels higher than you in just what you get as quest rewards. You will want to upgrade gear every 5 levels, or so, but if you are power leveling, those levels will go by very fast. Dailies are another source of fairly easy income. 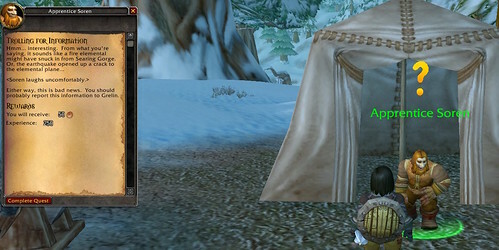 Low level toons can do the fishing and cooking dailies in the major cities. Hubs in Mists of Pandaria, such as here at Niuzao Temple, have multiple dailies in one location. You can easily clear 50 gold from these hubs; sometimes over 100 depending upon what the mobs have on them which can be vendored. Dailies are designed to be reasonably quick with a good payout. Once you learn where everything required is, you can bang out quite a few in a couple hours. Finally, you can play the Auction House, particularly if you get a blue or purple bind on equip piece. 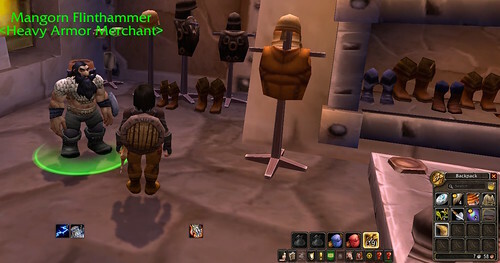 Unusual pieces are sought after for transmog and can pad your coinage totals very nicely. Other people find the auction house to be great fun, for figuring out which materials to buy low and sell high. If you have gathering professions, selling the raw materials makes money, but not in vast quantities unless you happen to be on a low population server where people are leveling a lot of alts. That being said, all it takes is one person to be looking for Dreamfoil or Fel Iron or embersilk and they will pay whatever price you have listed for the materials. If you choose to "play" the Auction House, get an add-on to help you and read the Undermine Journal. Do not buy gold. That is an offense which will get you banned. Also, don't pay money for a leveling service. Those are not a prevalent as the gold offers, but they are still there. You don't need a leveling service. Even if you have 2 hours per week to spend trying to make gold, you can do it without paying someone. You have to give them personal information, too, which can compromise your computer. Just don't. I find money fairly easy to make in this expansion. It's not boatloads of money and it's not instant, but in the 2 weeks since spending 100,000 to buy my Alliance chopper, leaving me with 250 gold, I've made 9,000. There are a lot more suggestions for making gold on web sites such as WOWHead. As a casual player, you have just a limited amount of time to do all this game has to offer. Having more than what amounts to pocket lint can make the whole gaming experience much better. I hope these suggestions will help you add to your wallet.